This keto bread is excellent for those who follow a low-carb diet. It allows them to enjoy grilled cheese sandwiches or French toast without sacrificing their carb count. Plus, it’s delicious. Using more eggs and healthy fat is the secret to making a light and airy keto bread which could hold up to the toaster. When it comes to ghee, you need to cook it longer to remove milk solids. This, in turn, makes it a better option for those with lactose sensitivities. You can add a teaspoon of stevia to the batter and top it with Paleo ice-cream or berries if you want to get a sponge cake-like bread. Also, replacing almond meal with almond flour will give a finer texture to the bread. Use a hand mixer on high speed to beat the eggs. This will give you an airier finished product because of the air incorporated into the eggs. Then, add the melted ghee and beat it, as well as the dry ingredients. After forming a batter, transfer it into a loaf pan. Don’t forget to line the pan with parchment paper first. Bake at 350F for around 40 minutes. Remove the bread from the pan using a sharp knife, pulling the parchment paper up to get the bread out. Let it cool for ten minutes and then slice. Thanks to Jennafer Ashley for coming up and sharing this recipe. Use a hand mixer on high speed to beat the eggs for a minute. Beat in the melted ghee until fully incorporated. Add the rest of the ingredients and beat on lower speed. Beat until you get a thick batter. Line a loaf pan using parchment paper and make sure it overlaps the sides. Then, pour the batter into the pan and use the spatula to spread it. Bake until the top is light golden brown, or for around 45 minutes. Leave the bread on a cooling rack to cool for ten minutes, and slice. Here’s a video that shows how to make this Low Carb Keto Bread. 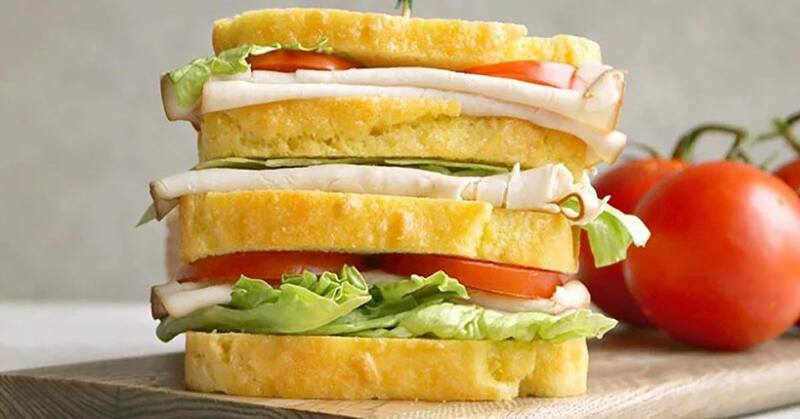 You can use slices of this bread to make sandwich piled high with your favorite fixings. Enjoy!